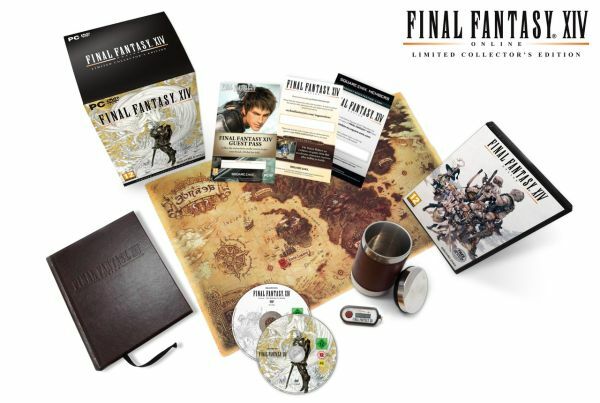 Square Enix revealed the details of Final Fantasy XIV collector's edition, to launch on September 22, 2010, nearly a week before the standard edition's release. There's still no news if the collector's edition will be a PC exclusive. * IN-GAME ITEM – Collector’s Edition preorders will include a reward code to receive an exclusive in-game item, the Onion Helm (an exclusive in-game item which accelerates character recovery after falling in battle). * EARLY ACCESS – Play 8 days prior to the release of the Windows PC Standard Edition (timing of access subject to initial server capacity). * BEHIND-THE-SCENES DVD – Get an insider look at the making of FINAL FANTASY XIV, with exclusive video content, interviews and more in this special documentary DVD. * SECURITY TOKEN – A FINAL FANTASY XIV–branded Security Token for use with your regular password. * TRAVEL JOURNAL – Record your travels in this beautifully bound journal filled with pages of never-before-seen concept art. * RIGHT OF PASSAGE – Redeem a voucher to receive your fully-personalized Right of Passage Certificate, each stamped with a unique serial number. * AMANO COVER – Special PC Collector’s Edition illustration by renowned artist Yoshitaka Amano.